In ultrasonic techniques, information on defects characterization possibilities have required more evolved techniques development than classical methods. To obtain a high probability of defect detection, these methods use signal processing algorithms in order to enhance signal to noise ratio. In this paper, some signal processing algorithms like split spectrum processing (SSP) and wavelets are developed and implemented on computer allowing their utilization in processing of ultrasonics NDT results. Key words :NDT, Ultrasonic, Split spectrum techniques, continuous wavelets, digital wavelets. The Non Destructive Testing has to allow to obtain the highest possible probability detection, the most exact size and the exact orientation of dangerous defects that the specimen to control can contain. New methods in ultrasonic NDT have been developed since some years. They are based on the fact that the ultrasonic signal received from a defect contains a sum of information forsaken by the classical techniques. These later consider that the essential information to take into account is the maximal amplitude of the ultrasonic echo collected and this whatever the nature of defects. The possibility to acquire some information allowing to characterize defects in nature, size and orientation has necessitated the development of techniques more evolved than those that are regrouped under the general technical term of ultrasonic imaging. Develop an algorithm called Split Spectrum Processing that consists in dividing the echo defect spectrum in slices and apply the inverse Fourier transform in order to improve signal noise ratio. Develop an algorithm based on wavelets transform in order to enhance flaw visibility. This tool have generated much interest in various applications such as speech coding, pitch detection, image compression, multiresolution analysis and estimation of multiscale processes. The idea of examining signals at various scales and analyzing them with various resolutions has, in fact, emerged independently in many fields of mathematics, physics and engineering. Wavelet decomposition introduces the notion of scale as an alternative to frequency and maps a signal into a time-scale plane. Each scale in the time-scale plane corresponds to a certain range of frequencies in the time-frequency plane. Show the application of these techniques on very absorbing materials containing defects. Through this study, we can show that application of signal processing techniques in ultrasonic can be an optimal solution to the different problems encountered in NDT of materials. We achieve N acquisitions of the presumed defect signal and we make a temporal mean. with bi(t) = noise uncertain section (no reproducible from one experience to another) measure and amplification noise,wi(t) = noise coherent section , owed to reflections parasites (noise of grains or geometry defects), part reproducible from one experience to another,si(t) = defect signal. This average allows to reduce the uncertain part of the noise. The coherent part of noise is not modified. The signal to noise ratio gain is in general weak, the noise measurement represents a weak part of the observed noise only. For it, we developed algorithms based on techniques named Split Spectrum Processing and wavelets transform improving this ratio. This technique consists in working in wide band and to cut the signal spectrum up in slices (Split Spectrum Processing ). in order to give back the maximum of output signal to noise ratio. Since SSP employs constant bandwidth windows, the time-frequency resolution is fixed over the entire time-frequency plane. This imposes a limitation on the analysis of high frequency signals of short time duration as resolution in time and frequency simultaneously cannot be made arbitrarily small. An alternate method of spectral decomposition which overcomes the resolution limitation of constant bandwidth windows, may instead be utilized to obtain the frequency diverse ensemble. The constant relative bandwidth decomposition employs wide band windows at high frequencies and narrow band windows at low frequencies in contrast to the constant analysis window ( .2). We can see also it in time-frequency plane (fig.3). Minimization method (expression given in paragraph 2.1). The frequency diverse ensemble with constant relative bandwidth may also be obtained through the continuous wavelet transform (CWT). As widely documented, wavelet has generated much interest in various applications such as speech coding, pitch detection, image compression, multiresolution analysis and modeling and estimation of multiscale processes. Where variables a and b are simultaneously the dilatation and the translation parameters. where y m,n(t) constitute an orthonormals functions family. Where Wm,n are details parameters. In order to apply Split spectrum processing and wavelets methods, we have chosen a very absorbing ultrasonic material sample. We can see in this signal, an echo with coherent noise between 2 and 4 micro-seconds, the results are displayed graphically and discussed. In figures 4 and 5, we have applied constant bandwidth algorithm in order to enhance signal to noise ratio. With theirs methods (minimization and square root of product), we can confirm that give a good signal to noise ratio. In figures 6 and 7, we have applied Q constant algorithm on the same signal and a simulated signal. We have obtained a better result. Continuous wavelets are applied also, figure 8 shows results given by this tool. Image illustrated by figure 9, demonstrates energy concentration at the same echo position. Finally, in figure 10 we have tried to apply discrete wavelet on the same signal, we can say that we have obtained a good detection of defect echo but we have to investigate in this field in order to enhance signal to noise ratio. Fig 4: b constant SSP minimisation method. Fig 5: b constant SSP by square root of product method. Fig 6: Simulated signal.Q constant SSP square root of product method . Fig 7: Q constant SSP. 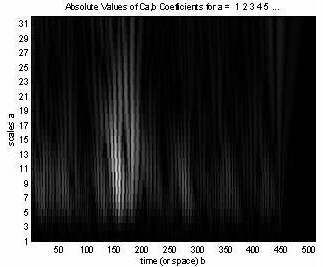 Fig 8: Continuous wavelet Transform Fig 9: Calculation and drawing of CW coefficients. Fig 10: Discret Wavelet Transform. Paradis, L. Development of methods and a device of signal processing adapted to NDT by ultrasonic waves, Thesis of Doctor Engineer, INP Grenoble, (1983). Drai, R. Khelil, M. & Benchaala, A. "Elaboration of some signal processing algorithms in ultrasonic techniques : Application to materials Ndt.". Ultrasonics, Vol.38 (1-8)2000, pp.503-507 - Ed. elsevier. Bilgutay, N. M., Newhouse, V.L., and Furgason, E.S. "Flaw visibility enhancement by split spectrum processing technique". Ultrasonics symposium. (1981), 878-883. Rashmi, M., Bilgutay N. M. and Kagan Kaya, O. "Detection of ultrasonic anomaly signals using wavelet decomposition." Materials evaluation (Nov. 1997), 1274-1279.